"Honey butter is very good on homemade white bread. I ate and made this many times as a girl. You may also use peanut butter instead of butter. Delicious!" 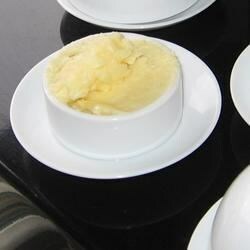 Place butter in a small bowl. Gradually add honey, beating constantly, until desired thickness is attained. Let your slow cooker make this irresistible apple butter for you. Way too much butter. Try using butter and honey in equal proportions to create much sweater breakfast spread. This stuff tastes amazing. I only used 1/3 instead of 1/2 cup of honey. It still tasted great. I used them on the popovers (from this site). Thanks so much for posting. Love this mixture. Lots better than the other proportions out there. You can really taste the sweet and the honey. Delicious, the best! It was great!!! My kids loved it and even my husband! (although he wont admit it)I now make it all the time! u gotta try it!